My mate Stephen, who gave me the pile of gaming swag that inspired this blog, has (or at least, had) a rather unhealthy fixation with the Alien universe. He had the films, he had the comic books, and every time there was a game released based on the films, he would buy it sight unseen. I did try and tell him that this might not always be wise, but would he listen? Noooooo. One of the games in my pile is Alien on the Commodore 64 (you'd probably guessed this from reading today's title). I definitely didn't play this on his machine... he probably kept it to himself, on account of it looking and sounding shite. And it's not the sort of game I really like anyway, so he was probably doing me a favour. However, since it's in my pile, it's fair game for the blog. I figured I might as well give it a shot, and at the very least it would probably inspire me to watch the film again. Now I've got no fingernails left. Thanks, Argus Press Software. Alien is one of the most tense games I've ever played. 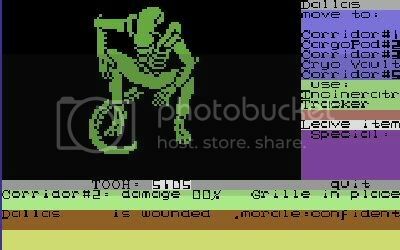 It's about as basic looking a game as you'll find... most of the graphics could be (and maybe have been) drawn with the C64's character keys. But that matters not. All that matters is that the game sets the right atmosphere, and it does. 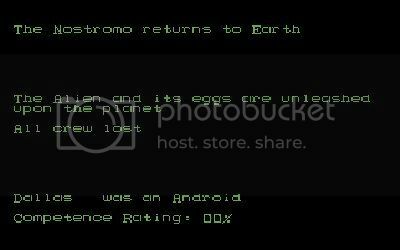 The game starts with a text message informing you that Kane has been killed by the alien. That's hardly a spoiler. What you then have to do is try and organise the remaining team members, move them around the ship and find the items you hope will kill the alien. And of course, actually manage to kill the alien, which is easier said than done. Oh, and one of the team is an android... unlike the movie, it's different every time... and it pays you to determine which of them it is, if possible. The ship is divided into three decks, and you move one turn at a time. There are also grilles all over the ship, which you can remove and then move around using the ship's duct system. It's all very well thinking you can sneak around like this, but the alien can also use the ducts, and there's nothing worse than stealthily moving through the inky blackness, turning a corner and BUMPING RIGHT INTO THE ALIEN! AAAAARRRGH, JEEEESUS CHRIST!!! It wasn't for me, I stayed rubbish at it. But I have to say, given the very basic appearance of the game, it's got a hell of a lot going for it. Just goes to show, ugly doesn't always mean bad.